Here on the West Coast, certain manga bloggers aren't immune to romance problems of their own. Sometimes, said manga bloggers, who will not be named, want to just read a cute and ideal love story and fantasize for a moment that love is just that easy. Tonight I had the opportunity to read Rainy Day Love. It is adorable. Yes. I know, crabby Shakespeare who usually just wants to be critical of everything is saying: this manga is pretty darn sweet. Older Teen Yuta works in his family's senbai shop. When his younger highschool buddy Shizuno appears, Yuta realizes he has feelings for him. There's not too much struggling here, not too much angst. There's just a little fumbling, a fever and some love. Shizuno's been in love a long time and has some very adorable fantasies about Yuta, which Yuta can't live up to. But, it's okay, because the real Yuta is more adorable to Shizuno than the fantasy one. 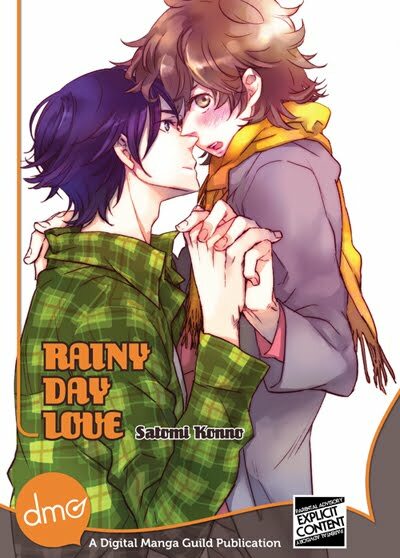 The real charm of this manga for me is the older couple comprised of Shoichi, Yuta's older brother who also works at the senbai shop, and the usually intoxicated Seigo, a family friend who had been in love with Shoichi since they were kids. They are one of those "one part flaky but earnest and lovelorn, one part kind and responsible and terrified to get involved" couples that you just want to root for. I actually think that the mangaka liked the older couple more than the younger couple, too, because they're drawn a bit better than the younger couple. Or maybe I am just an old lady and prefer to look at more mature male characters. Speaking of artwork, it feels a little lazy at the beginning, but really gets much better toward the end. Some of the chibi characterizations in this are just cute as cute can be. On the tail end of Dr. M's translation rant, I have to say that the translation for this story was really great. How do I judge that? Because, I didn't have to think about it. It was natural, well-paced and clear. I was able to get into the story and get away. Sigh. Certain manga bloggers wish that love would just show up on their doorstep and confess itself or bumble into their workplace and have an outburst or go through some deep soul searching on their behalf. Someday. Maybe. And on that day there will be plenty of wind. The need for conveying the actual style of speech – so to say street language or slang – is very important. Not every translator can put themselves into this kind of world to capture the subtleties of the original and get them across in the target language. Professional translation companies though, carefully choose the right translator for each particular project to ensure good quality.